I’m an independent personal trainer based in Aylesbury, Buckinghamshire. I pride myself in offering high quality professional personal training, in my own specifically designed ‘one to one’ training studio. I’ve been a full time trainer since January 2005 and as of 1st January 2019 I have completed over 14,000 hours of individual training sessions. I’m registered at Level 4 (the highest level) on the Register of Exercise Professionals, the regulatory body for the health and fitness industry. I’ve always believed physical fitness, good health and general wellbeing are vital for anybody to be successful. Also, I feel there is a distinct relationship between a healthy body and a healthy mind. I wholeheartedly promote this philosophy in my training and I’m passionate about changing peoples lives. 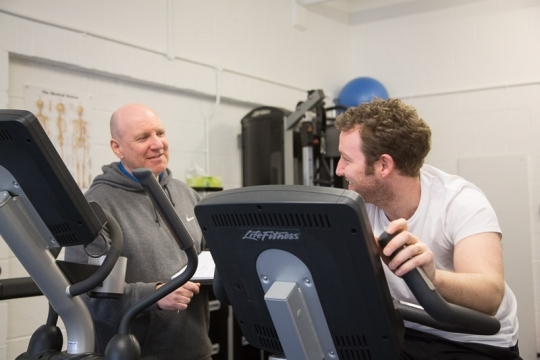 Therefore my role as a personal trainer is to help my trainees improve their physical wellbeing which always has a really positive effect on all the other areas of their life. I look at the big picture and take a holistic approach with my personal training analysing; medical history, personality, lifestyle, occupation, nutrition, exercise history and current activity levels. The recommendations I propose are based on my findings assessing these various different factors. I also find I can empathise with my trainees as I have come from an industrial background working as an executive in the entertainment industry. This has given me a crucial understanding of the various different pressures people face trying to earn a living and trying to be successful but also trying to lead a healthy and balanced life. My personal training is goal orientated and I really can’t stress this enough. Every session is planned with a view of working towards the next target and progress is closely monitored throughout. However, I feel it is important to remember that your personal training should complement your lifestyle not take over it. Therefore, achieving your goal should be fun, enjoyable and responsible to those close to you. I have had the privilege of training many different kinds of people working towards achieving a wide variety of goals. These range from getting fit for the start of the football season to rehabilitation after major surgery. However, my specialist area of expertise is ‘long term sustainable weight loss’ with a proven track record in successfully helping trainees reduce body fat, increase muscle tone, change body shape and most importantly; lose weight and keep it at an ideal level for the long term.